In the past couple of weeks, our 3 kids have started athletics training again to prepare for the coming season. A couple of nights ago, as we arrived at the track, there was an older boy being put through his paces by a coach. This young man wasn’t in great shape and it looked as though he was about to collapse when his coach told him to do one more run through. The boy looked exasperated and said that he couldn’t do any more. And the boy did just that. Shuffling slowly, and huffing and puffing as he went, he made it to the end. We’ve all been that boy. We’ve all been at the end of our resources. We’ve all felt that we had nothing left to give. And in that moment, we have a choice. 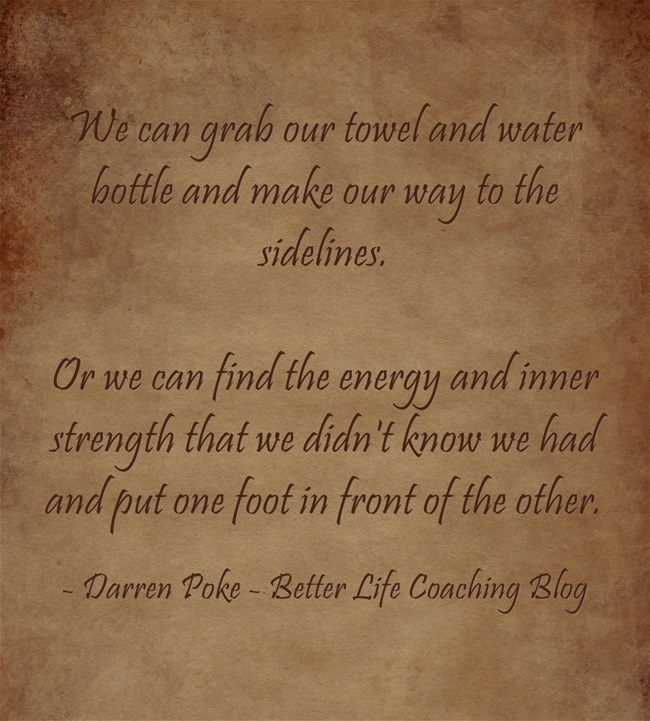 We can grab our towel and water bottle and make our way to the sidelines. Or we can find the energy and inner strength that we didn’t know we had and put one foot in front of the other. And slowly, inexorably, make it to the finish line.